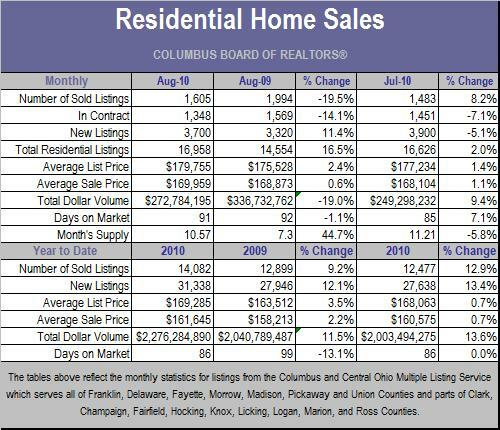 August home sales in central Ohio were higher than the previous month and the average sale price of a home sold continues to rise. There were 1,605 homes sold in August which is 8.2 percent more homes sold than during the month of July. Home sales during the first eight months of the year are now 9.2 percent higher than the same period in 2009. The average sale price of a home has been inching back up this year from $145,993 in January to $169,959 in August. The average sale price year to date (January through August) is $161,645, which is 2,2 percent higher than one year ago. There were 3,700 homes listed for sale last month bringing the total number of homes for sale in central Ohio to nearly 17,000 which is 16,5 percent more homes than were on the market at the end of last summer. This entry was posted in Columbus home sales statistics. Bookmark the permalink.